The ParkCloud Parking Awards – the results are in! 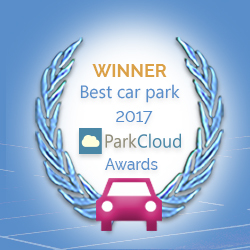 The time has come to announce the winners of our 2017/18 ParkCloud Parking Awards! We asked our trusted customer base to nominate car parks across Italy, France, Germany, Spain, Belgium, Netherlands, Poland and the United Kingdom, that they felt deserved recognition for going above and beyond – and the response was incredible! With near to 3 million registered users and over 2,000 car parks, ParkCloud has always been passionate about connecting drivers with parking that suits their individual needs, and we’re thrilled that our awards give us the opportunity to shout about some of the great operators we work with! …and new for this year is our inaugural Enterprise Award! Voters were asked to vote for a single company (with 5 car parks or more) that they felt went above and beyond to offer excellent car park facilities, and we’re pleased to announce Aeroporti di Roma came out on top!